Today is Jon’s birthday so naturally I’m making him a special birthday dinner. This will actually be one of three special birthday dinners I’ll be making for him this week, but who’s counting! Tonight’s dinner is from the pages of my upcoming cookbook, Vegan Without Borders. The recipe is for Trofie alla Presto with Green Beans and Potatoes — the photo is by Sara Remington who took all the gorgeous photos for the book. This recipe is a classic Ligurian dish that I’ve made before — and which Jon loved — and since I happen to have a bag of imported trofie pasta on hand and loads of fresh basil, it’s the ideal choice for tonight’s dinner. Trofie pasta is a specialty of the region where it is rolled by hand and commonly served with Pesto Genovese. Vegan Without Borders includes a recipe for making your own trofie, or you can simply substitute any type of bite-sized pasta — I recommend gemelli or cut fusilli. It may seem odd to combine both pasta and potatoes in the same dish, but believe me, it works! In a food processor, combine the garlic, pine nuts, and salt to taste and process to a paste. Add the basil, drizzle in the oil, and process until smooth. Transfer to a bowl, cover with plastic wrap placed directly on the surface of the pesto. Set aside. Steam the potatoes over a pot of simmering water until tender, about 10 minutes. Set the potatoes aside, then steam the green beans over simmering water until tender, about 6 minutes. Set aside. Cook the pasta in a large pot of boiling salted water until it is al dente. Drain the pasta and return to the pot. 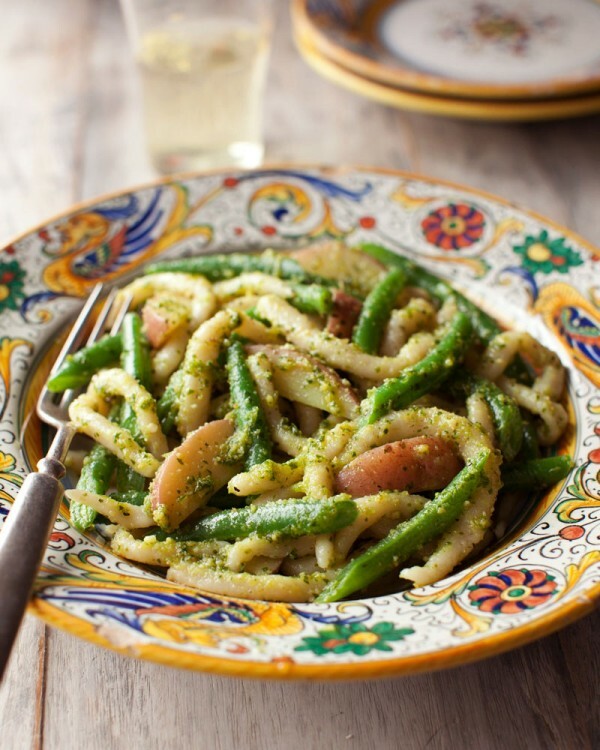 Gently stir in the steamed potatoes and green beans, reserved pesto, and 2 to 3 tablespoons of the hot pasta water. Cook for a few minutes, until heated through and combined. Season with salt and pepper to taste. Serve immediately. Looks terrific and easy! Have to fine some nice green beans at the market next week. When we had our farm in Mich. we grew all our veggies and now thankfully we have plenty of fresh markets in the area. It’s great that you can find good green beans, Betsy. They make all the difference in this dish. When the weather is cooler, I like to roast the potatoes (instead of steam or boil them) for more flavor.